The holiday season is full of activities and parties not just for the kids. Finding time for a healthy meal among all the chaos and amazing sweets is challenging. Since we are a big pasta family, it tends to be my go-to food when I have run out of ideas or need an easy recipe in a pinch. Pasta is so versatile you can up the ante a little and create a healthy but elegant weeknight dinner. 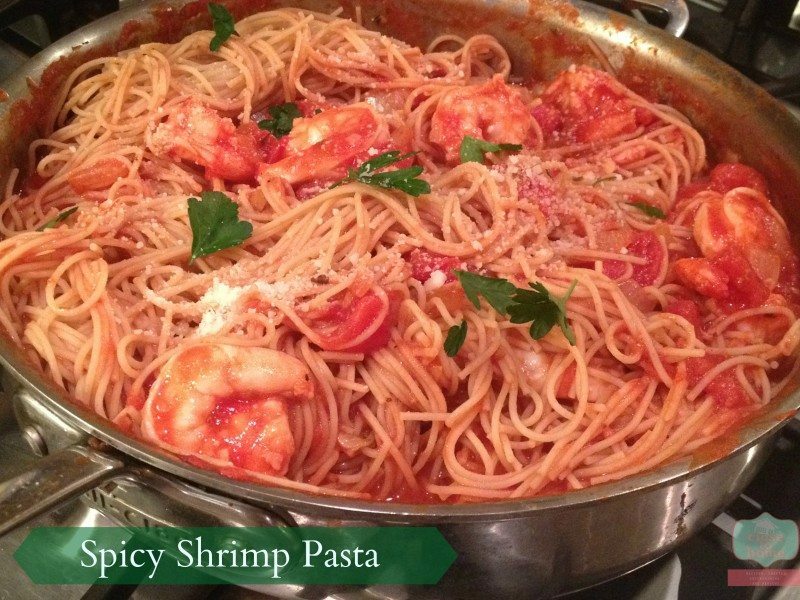 This Spicy Shrimp Pasta post is part of a social shopper marketing insight campaign with Pollinate Media Group™ and Barilla, but all my opinions are my own. #pmedia #pastanight . Since my kids love any type of Pasta it is easy to squeeze some extra nutrients by using Barilla Better For You pastas such as Barilla Plus, a good source of Protein, Fiber and ALA Omega-3, Whole Grain, Gluten Free, Veggie or White Fiber varieties. Unless they read the box they won’t have a clue you are adding extra nutrients to their favorite dishes. 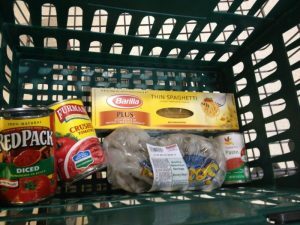 To get inspiration for dinner, I headed over to our Martins Food Market and saw some peeled and deveined shrimp on sale. 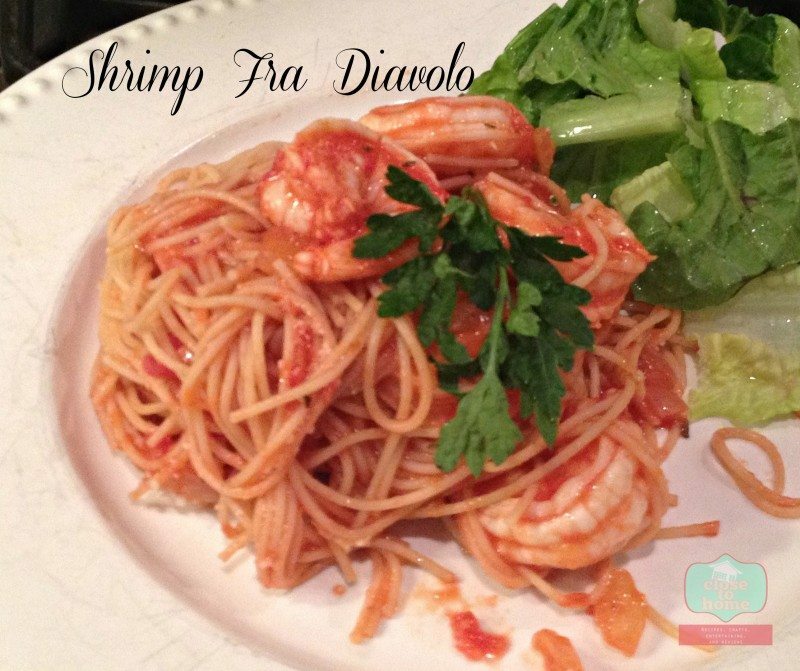 My family loves spicy dishes so I found a Shrimp Fra Daviolo or Spicy Shrimp Pasta recipe on Cooking Light. 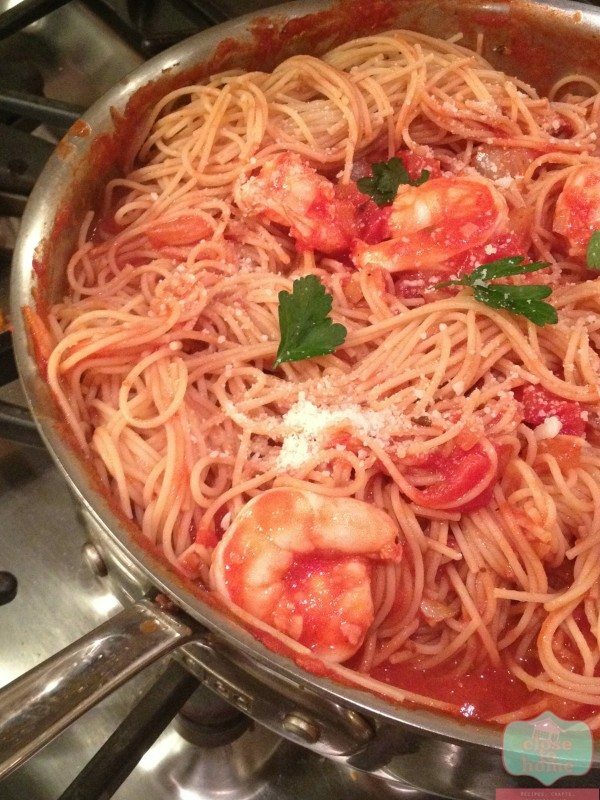 Since the shrimp was already prepped this was a super quick but elegant meal that can be made any day of the week. 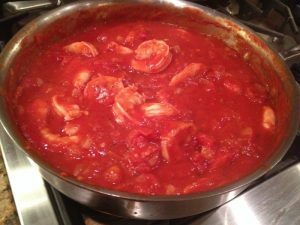 I adapted the recipe slightly as I needed to pick up kids at several different times that evening and knew I needed to make the sauce first since I did not want the shrimp sitting out warming somewhere for too long. 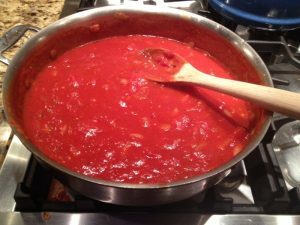 I prepped everything for the red sauce by sautéing the onions and garlic first, then added the tomato sauce and a little sugar. I let that cook up for about 15 minutes while I started warming the pasta water. When I was ready to serve dinner, I waited for the water boil again, added some salt to the water and added the Barilla Pasta. I set the timer for 4 minutes. While the pasta was cooking I allowed the sauce to get hot again and added the shrimp when the sauce needed about 4 more minutes. Just cover the pot and allow the shrimp to cook. 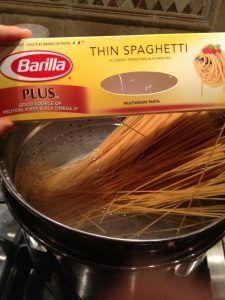 I like to add the pasta right into the pan I use to cook the sauce and then serve from there when it is just our family. Why dirty another serving dish? Add some parsley for color and flavor. Sprinkle with Grated Cheese, we use Pecorino Romano cheese. Serve with some additional cheese and red pepper flakes for those looking for some more kick. Serve with a side salad and Enjoy. A healthy pasta dish that is both easy and elegant for any night of the week. 2. While pasta cooks, heat 1 tablespoon oil in a large nonstick skillet over medium-high heat. Add 1 1/2 teaspoons garlic and shrimp; sauté or 3 minutes or until shrimp are done. Remove from pan; keep warm. 3. Add remaining 1 tablespoon oil and onion to pan; sauté 5 minutes or until softened. Stir in remaining 1 tablespoon garlic, pepper, basil, and oregano; cook 1 minute, stirring constantly. Stir in tomato paste and lemon juice; cook 1 minute or until slightly darkened. Stir in crushed tomatoes, salt,sugar and diced tomatoes; cook 5 minutes or until thickened. Return shrimp to pan; cook for 2 minutes or until thoroughly heated. Serve over pasta. What is your go to Healthy Pasta Dish?